For the best heating and air conditioning service, call us at (757) 545-5569 today. Pay attention to your system. If it is not keeping your home as comfortable as before and your electric bills have increased dramatically, you may be making the biggest mistake of all: failing to have your system serviced on a regular basis. Over time, dirt and debris build up inside a system, lowering efficiency. Not only will your home become uncomfortable, but you will spend a lot more money on electric bills. You also risk a costly repair and the loss of your manufacturer’s equipment warranty, which can be voided if a proper maintenance schedule is not followed. Be sure to ask us to inspect your air conditioning system at least once a year. On your own, you should change or clean the system’s air filter about once a month to keep your system running as efficiently as possible. Some people turn off their cooling system when everyone leaves the house for the day. When they get back home, especially on a hot day, they will turn the thermostat as low as possible to speed up the cooling process. But this won’t cool your house any faster! It just keeps your system working longer than necessary and will cost you money, especially if you forgot to reset the thermostat to an energy-saver mode. The best advice is to program your thermostat at a set level; the “sweet spot” for most people is 76° to 79° Fahrenheit. The setting is important because studies have shown that every degree represents a difference of about 7% in power consumption. So keeping your thermostat just a little higher can make a difference in your electric bills. You should also consider upgrading to a wireless thermostat. This lets you view and change temperature settings, check indoor humidity levels and more, all from your smartphone, PC or tablet device. You can even receive alerts when you’re away from home to let you know if there is a sudden or drastic change in temperature or humidity that could indicate a breakdown. Don’t make the mistake of leaving any windows or doors open when your air conditioning is running. You’ll force your a/c unit to work harder to keep you comfortable. You should also limit your use of exhaust fans in the kitchen or bathroom. Running these fans will pull cool air out of your house. Something you should do is to run ceiling fans when your air conditioning system is on. This will move cool air more efficiently around your home, creating a wind-chill effect. (Air movement evaporates moisture on the skin and makes you feel cooler in the summer.) Using ceiling fans allows you to keep your home comfortable at higher room temperatures. Setting boundaries in the space around your outside air conditioning unit — with flowers, shrubs or other objects — is important. Make sure there is 18–30 inches of clear space around the unit to allow it to “breathe.” This helps it run more efficiently. Don’t stack anything on top of the unit, like garden hoses or landscaping tools and products. When mowing the lawn, position the mower away from the unit. This will help you keep grass clippings and other debris from getting blown into your system and reducing its efficiency. Even small amounts of dirt that work their way into your condenser can dramatically affect cooling performance. This results in higher energy bills. Breaking up can be difficult. Thankfully, today’s systems are far more efficient than systems installed just 12 to 15 years ago. According to the U.S. Department of Energy, even if your cooling system is only 10 years old, you could save 20% to 40% on your air conditioning costs by replacing it with a newer and more efficient model. You will also avoid the high cost of adding expensive Freon to your aging system. Older cooling systems use Freon, which will no longer be manufactured after 2020. Freon is considered a greenhouse gas and harms the environment when released into the air. Because of the impending phaseout, less Freon is being made. This has resulted in rapidly dwindling supplies — and skyrocketing prices. All the a/c systems we install use an economical and environmentally friendly refrigerant instead of expensive Freon. 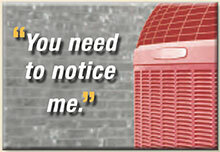 Pallett Heating and Cooling is a leading residential fuel and equipment service provider in the Hampton Roads area. You can always rely on us to be there for you! Call now to speak directly with a courteous customer service representative.